"Since childhood I’ve been faithful to monsters. I have been saved and absolved by them,” said a visibly moved Guillermo del Toro while accepting his Golden Globe for Best Director early last month. “Monsters, I believe, are the patron saints of our blissful imperfection, and they allow and embody the possibility of failing and living,” he added. The Shape of Water may be the first film for which the Globes have recognised the Mexican film-maker, but he has explored the theme of monsters over an illustrious 25-year career. From Pan’s Labyrinth (2006) to Pacific Rim (2013), del Toro’s love for magically strange worlds has been abundantly clear. His latest film takes us back to the 1960s. Here we meet Elisa Esposito (Hawkins), a mute woman who works as a janitor at a secret government lab in Baltimore. Her otherwise mundane life changes when an amphibious creature is brought into the facility for experimentation — and she ends up falling in love with it. The monster, Elisa feels, does not view her – without a voice – as an incomplete person. With this fairly straightforward premise, del Toro manages to tell a surprisingly nuanced story about class, race and love. Above all, this is a film about disability and what it means to be human. Hawkins’ sure-footed portrayal of Elisa truly brings home this point. At the beginning of the film, Elisa appears to be meek and closed off, but as her love for the monster grows, she becomes more and more fearless. Hawkins communicates all this and more through her body language alone, without any dialogue to assist her. The only time we see Elisa speak – or rather sing – is during a dream sequence. As she fantasises about communicating with the monster sitting across her at her dining table, the lighting in the room changes and the scene transforms into an old Hollywood style film set. A fade-to-black later, the imagery is in black and white, and Elisa is dressed for the occasion in a beautiful gown. She starts to sing “You’ll Never Know” from the 1944 film Four Jills in a Jeep. The result is a surprisingly moving scene. This is just one of the places where del Toro masterfully uses music to elicit emotion from the audience. It is no wonder then that the film’s soundtrack has been collecting accolades, including the Golden Globe for Best Original Score by composer Alexandre Desplat. The dream sequence is only one of the ways del Toro gives homage to old cinema — Elisa also lives in an apartment atop a movie theatre. When the monster breaks out of her apartment one evening, she finds him standing mesmerized in front of a film screen. Del Toro’s film-making, while being uniquely his own, also reminds one of works by other masterly film-makers. One of these is French film-maker Jean-Pierre Jeunet’s Amelie (2001) which used a preponderance of the colours green and red to set a certain fantastical look. 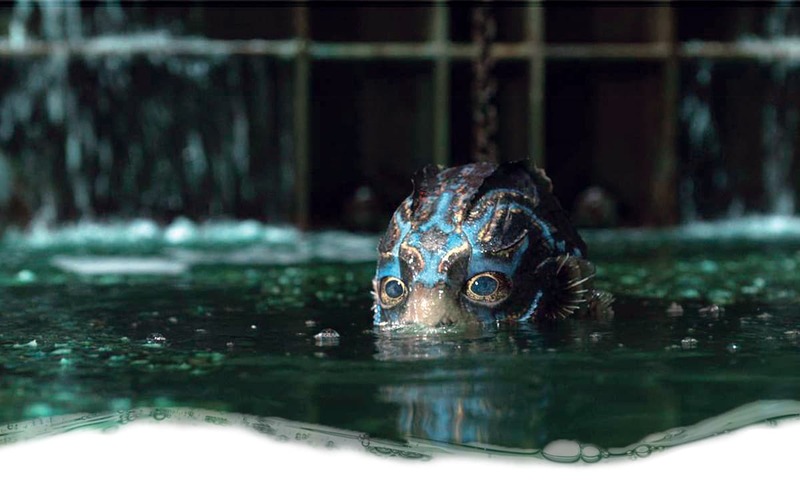 The Shape of Water similarly uses green throughout the film. The monster is green. The restrooms and labs that Elisa and her friend clean are green. When Elisa goes to work, her clothes are green. She starts donning a red jacket and red shoes only after the monster starts living with her — red clearly symbolising hope and passion. 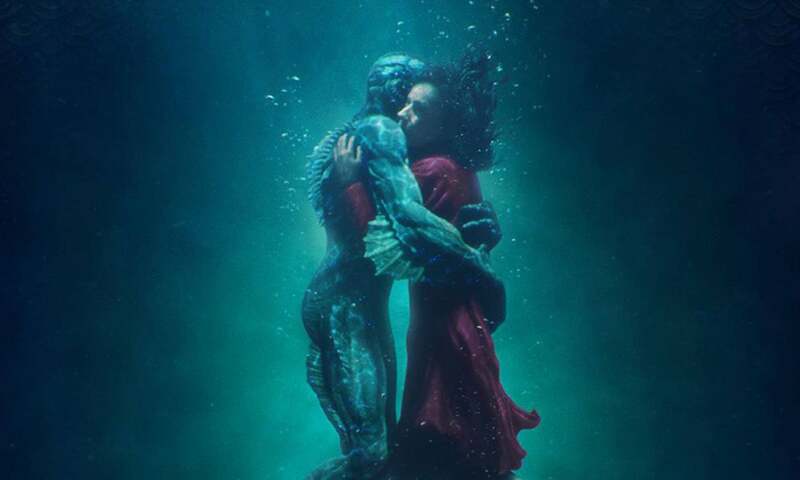 It is this attention to detail that makes The Shape of Water such a magical cinematic affair. On one level, del Toro appears to be critiquing the American dream. In one scene, Giles (Jenkins), Elisa’s friend and an artist who paints advertisements, illustrates a happy, white-collar family enjoying red jello for an ad. His employers tell him to make the family look happier, and to change the colour of the dessert. “Green is the colour of the future,” he is told. Discerning viewers would later notice a similar scene featuring the lab’s resident baddie, Richard Strickland (Shannon), and his family. As his wife presents him with green jello, and his children attempt to interact with him, Strickland is too preoccupied with thoughts of capturing the monster to enjoy a warm family moment. Del Toro plays with these analogies and metaphors throughout the film. This is most poignant when we learn that Giles is homosexual, and see him be humiliated by a heterosexual young man he has a crush on. This motivates Giles to support Elisa’s seemingly bizarre love for the monster. The ‘love is love’ message here is loud and clear. The Shape of Water manages to provide all this commentary without ever feeling melodramatic or losing its ability to find comedy in the absurd. As the award season picks up steam and we move closer to the Academy Awards, this Oscar hopeful is not one to be missed. This article was originally published in the February 2018 issue. To read more subscribe to the Herald in print.